Jeff Cable's Blog: How I photographed and created the composite of the "blood moon"
How I photographed and created the composite of the "blood moon"
As many of you know, last night I photographed the "blood moon". I thought that I would go outside my house, shoot some photos for 15 minutes and then go to sleep. But that did not happen, as I continued to watch the moon transition from a full moon to a red moon. For this shoot, I used a Canon 5D Mark III and the Canon 100-400mm lens with the Canon 1.4x extender. 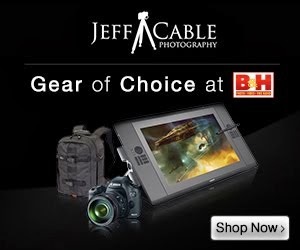 I mounted all this on my Gitzo tripod, using my new Acratech ballhead (which I love). I used a cable release to take the photos, so that I did not have any camera movement during the exposures. I used the live view mode of the Canon 5D Mark III to manually focus on the moon. I love going to live view and then using the 10x magnification to see the fine details. This makes the focusing that much easier. 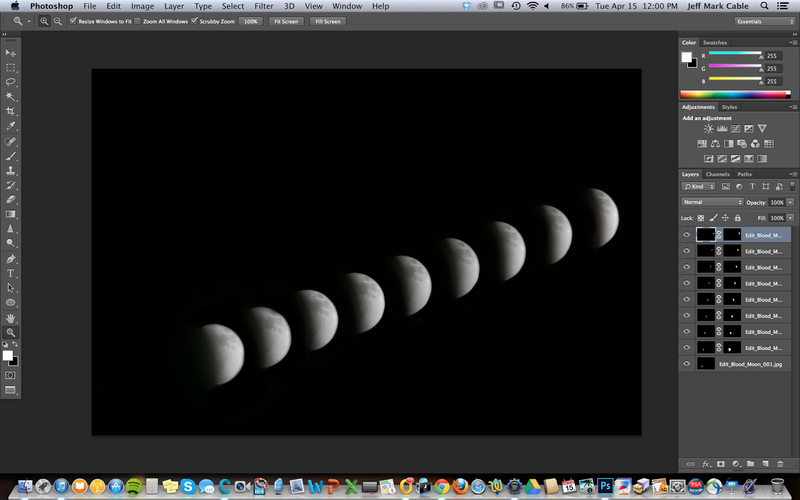 I started by shooting the beginning stages of the lunar eclipse. As I watched the moon cruising across the LCD of my camera, I saw an opportunity to shoot many photos and then combine them. I watched the movement and determined that one photo every minute and 45 seconds should work well. So...for the next hour and a half, I sat outside and shot photos at this interval. Every 8 or 10 shots, I would have to reposition the camera, since I was shooting at a focal length of approximately 600mm and the moon would go out of my frame. After shooting all the photos, I loaded them into separate layers in Adobe Photoshop. The easiest and fastest way to do this, was to go to "File" and then choose "Scripts" and then "Load Files Into Stacks". This would bring a group of photos into layers automatically. I loaded groups of 8 or 10 at a time, just like I shot them. I then created a layer mask for each layer, and used my Wacom pen tablet to paint in each phase of the moon as it moved across the sky. The image above shows the first sequence that I put together. This photo shows the last 6 photos that I added to the composited image. Once I had created each of the groupings, I then had to combine all of them into on large (500MB) image. I used the natural path of the moon to determine where the next group would line up. Here is the final image showing the full eclipse of the moon, and the transition to the blood moon. Not only was it well worth the time, and staying up late, but something really amazing happened last night as I sat outside and shot the photos. One might think that I was all alone, sitting in my driveway at 1am, but I was actually shooting with hundreds of friends. In between each frame, I would get on my iPhone and share my settings, see everyone else's comments, and see what other people were capturing. It was truly amazing to see the power of social media, as so many people from around the world were sharing with each other. Yeah, the moon was really beautiful, but the camaraderie and shared passion for photography was even better. For those of you who were there with me last night, thanks for keeping me company! Thank you for sharing this Jeff! Thank you for sharing your awesome photography! You are an awesome photographer, but better yet, you shine at sharing your expertise. Thanks from all the budding photographers who follow you! Thank you for being my inspiration. I learnt lot from you. This is great… wonderfully inspirational. I did not catch the subtlety that you can zoom in live view to make it easier to focus. I tried live view but without zooming it seemed worse than the viewfinder. I also switched from my Nikon D7000 to my D3200 due to the camera resolution increase, hoping the sensor in the newer D3200 was not worse than the D7000 even though the MP is 50% higher. I shot at 300mm. It was a fun night. Can't wait for the next one. Thanks for sharing. It almost blood moon again and stumble upon your blog on tips for photographing this. Question: What ISO, aperture, shutter speed did you use?